Apple iTunes 12 is different than what most users are used to. Learning how to transfer photos to the iPhone, iPod or iPad can be a daunting task for those who are used to the old way of doing things. Here’s how it’s done. From the PC where your photos are stored, open a web browser and visit iCloud.com. Sign in with the credentials for the account that is linked to your Apple device. Select the “Upload” icon, located at the upper right portion of the screen. Navigate to and select the photos you wish to upload. Hold the “CTRL” key to select multiple files. Select “Open” to upload the selected photo files. You should now be able to view the pictures in the “Photo” app on your iPhone or iPad. A button will appear toward the upper-left part of the screen. Select it to access the settings on the device. Select the “Photos” option on the left sidebar. 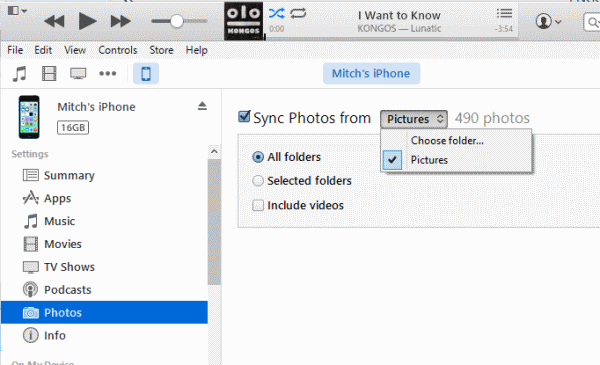 Check the “Sync Photos from” option, then choose to sync “All folders” or “Selected folders“. You can also select the “Include videos” check box to sync your personal videos. If you choose the “Selected folders” option, you will be give the option to check the folders you want to sync to the device. Click the “Done” button, then click “Apply“. iTunes will then transfer your photos over to your Apple device. after connecting my iPhone 5 to my Mac and there is no Photo icon shown under the phone device icon. It used to be there before but not these 2 years. I have had sleepless nights after purchasing a new iphone to transfer contents from the old iphone. I even considered formatting the phone before seeing this straight to the point steps. This and the “windows PC not recognising my iphone” have made my day.